The North American Combustion Handbooks provide a basic reference source on the Art and Science of Industrial Heating with gaseous and liquid fuels. First printed in 1952 it has been updated continuously to reflect advances in the technology behind combustion equipment and controls and is now in its third edition. More than 100,000 printed copies have been distributed worldwide. Although the stated scope of the handbook is Industrial Heating with gaseous and liquid fuels, the reader will find that the book also contains considerable information applicable to commercial heating and to solid fuels. Fives has endeavored to collect enough information under one cover to permit easy computation of typical combustion problems with a choice of several degrees of accuracy. Frequent use has been made of analogies and examples in order to make this handbook as generally useful as possible. Combustion basics: Flame temperatures, speeds, intensities. Fuels: Properties of solid, liquid, and gaseous fuels. Combustion chemistry: Air required. Flue gas analysis. Efficiency. Heat recover. Oxygen enrichment. Heat transfer: Modes. Factors. Practical Problems. Volume II includes the latest state-of-the-art information on combustion systems and their components. 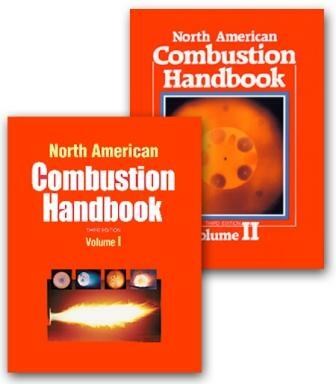 To obtain a copy of the North American Combustion Handbook, select and print your appropriate order form, complete it and mail it the address found at the bottom of the form.